The last plenary session of the BioEM2016 was dedicated to epidemiology with the title inviting to debate “New avenues of epidemiological research – added value or old challenges, or both?“. The set of invited speakers was also impressive, with Mireille Toledano (COSMOS), Elisabeth Cardis (GERoNiMO) and Martin Röösli (HERMES within GERoNiMO). 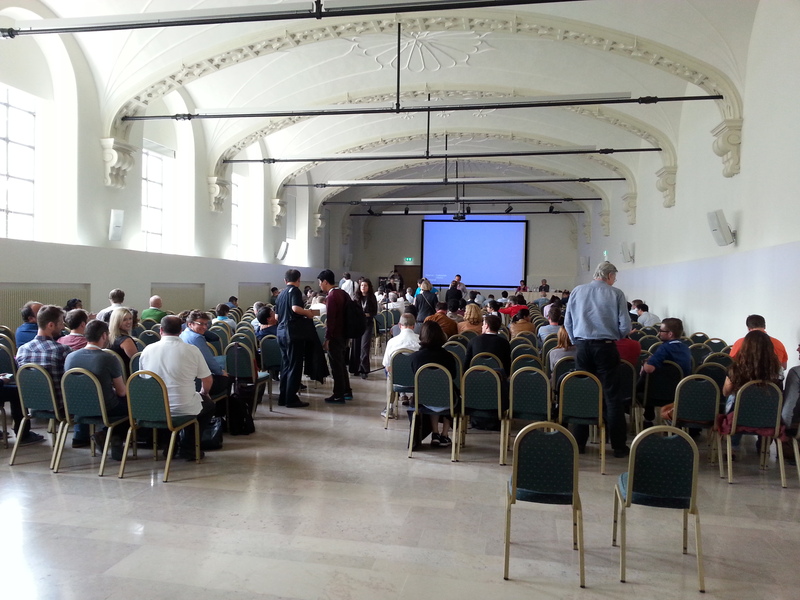 This setting kept people at the meeting and the last session, what not often happens, was well attended (photo). Unfortunately, the inviting to debate title of the session did not do the trick. Debate was sluggish and conventional. But also the presentations did not speak about any really “new avenues” of epidemiological research. The speakers presented and justified designs of the ongoing studies, COSMOS and GERoNiMO, with a bit of preliminary data. Nothing yet to get excited but the projects are still “young” and gathering data, what is a slow process. COSMOS just collected the first five years of data and we should expect soon first publications. GERoNiMO was in works for just a couple of years so there is not yet time for published results. Collecting information on number of made calls and on their length does not provide information on radiation exposure. As in studies done by Interphone, by Hardell’s group, by CERENAT, by Danish Cohort, by Million Women project, by Chapman et al., the COSMOS and GERoNiMO also collect a surrogate of the radiation exposure. None of the epidemiological studies executed to-date collected real radiation exposure data. All of them have collected either bad or very bad surrogates of radiation exposure. Graph, taken from my recent lecture at Monash University, explains, in a very simple way, why the calling minutes or years of contract with an operator are nearly worthless surrogate for the real radiation exposure data. Most of the exposure user receives from the cell phone. The further the cell phone is from the nearest cell tower, the more radiation cell phone emits to connect. Furthermore, any radiation absorbing obstacles between the cell phone and the cell tower, e.g. buildings or natural terrain, will cause the cell phone to emit more radiation. 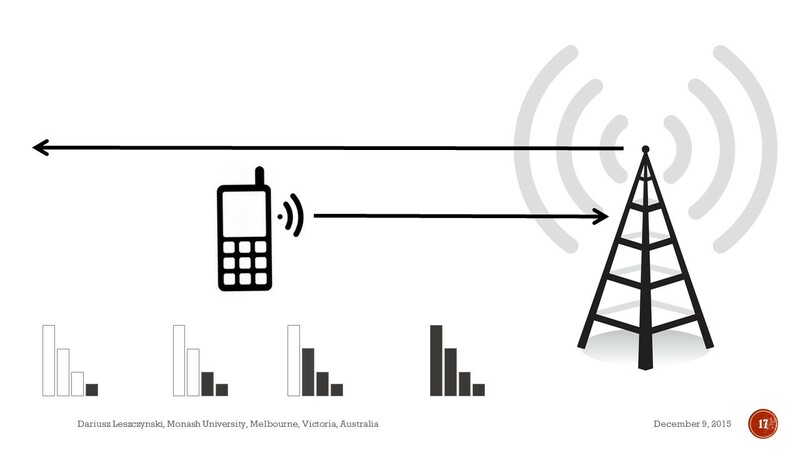 Thus, two persons making call of the same length may be (will be) exposed to a dramatically different levels of radiation, depending on person’s proximity to the cell tower. This means that placing two persons in the same exposed group, based on the length of the calls (or years of subscription with an operator), as done in epidemiological studies, puts together, in the same “exposed” group, highly exposed and minimally exposed persons. This might be the reason why the epidemiological data do not show, in more robust way than the three case-control studies, that highly exposed persons are at risk of developing brain cancer. This might be also the main reason why the dose dependency was never seen and it is likely it will not be seen in COSMOS and in GERoNiMO. Epidemiological studies are mixing high and low exposed persons in the same exposure groups! 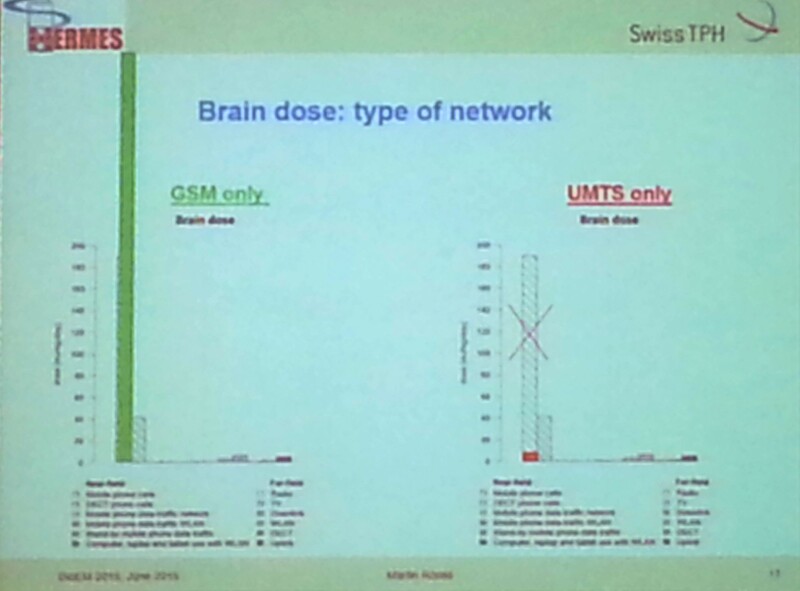 The only way to avoid some of the problems of radiation exposure in epidemiological studies is to install on cell phones (smart phones) of the participants of the epidemiological studies an app that will record on-line, up-link and down-link exposures, all exposures to network, cell phone and wi-fi. There are such apps available already for a couple of years, unfortunately only for Android but not for iPhone, and both COSMOS and GERoNiMO are kind of thinking to implement their use. Hopefully it will happen soon and the data of real radiation exposure will begin to be collected. This entry was posted in Mobile phones and health and tagged app, BioEM2016, CERENAT, Chapman et al, Cosmos, Danish Cohort, dosimetry epidemiology, Elisabeth Cardis, GERoNiMO, group 1, group 2A, group 2B, GSM network, HERMES, IARC, Interphone, Martin Röösli, Million Women Study, Mireille Toledano, real radiation data, smart phone, the Precautionary Principle, UMTS network by dariuszleszczynski. Bookmark the permalink. Tom, if you have more precise tools, please let me know. Re “self-diagnosed” EHS people: The medical profession in general is unaware of the health risks of electro magnetic radiation. Very few have even heard about EHS. For most of the world’s occupants it is almost impossible to obtain a diagnosis due to lack of knowledge in medical communities. The risk of the general population being misdiagnosed with ailments like depression and fibromyalgia,etc is far greater than self diagnosis.The question remains,how many people (including children) are there today that unknowingly have EHS? There needs to be a massive education drive aimed at recognition and diagnosis,starting from medical students right up to specialists like neurologists. Dariusz, very good conclusion of “data collection”, of different studies like Cosmos. Unfortunately Cellraid could not participate for BioEM2016, but our technology is still available for studies like COSMOS or Geronimo etc….if they wish to use our tools. As Dariusz said, it does not really matter how many minutes the user uses voice or data service…it matters more where the user talks and uses his data services, and where the phone is at that point (pocket, hand, table, head…). Quanta Monitor & Quanta Pro are tools, that consider Exposure from uplink (phone) + dowlink (antennas) + wifi, and also reads where the phone is (on hand, head, pocket, table…). Quanta Monitor is on Playstore (free) and Quanta Pro to measure for professional use, is available directly from us (pasi.ala-mieto@cellraid.com). Additionally we have Quanta Monitor and Quanta Guard research versions, especially useful for studies that are mentioned on the blog. Excellent post Dave. There needs to be co-ordinated action to apply pressure on government authorities to review the current Safety Standards. How can anyone have confidence that the so-called experts advising these authorities know what they are talking about when some countries have allowable exposure limits hundreds or thousands of times lower than others. You pointed out Dariusz correctly that this constant switching from one network to another should be understood better when defining exposure. This is situation quite relevant in trains and subways nowadays, devices constantly swiching from 3G to 4G & back, causing constantly rather high peak values. In the real world, we are all exposed to numerous sources of pulsed microwave radiation 24/7, regardless of whether or not we ourselves have cellphones, wifi etc. (I don’t). If I was exposed to second-hand smoke at work, in a train, or in many other public places, there would be an outcry in many countries, as – finally – action is taken on tobacco, and exposing others to this carcinogen is frowned upon, or is illegal. However, I am exposed to second-hand radiation that is linked to an astonishingly long list of health issues, and which is (at least) a possible carcinogen. I did not give my consent for this, nor would I ever do so. Many experts have demonstrated that this radiation does not have to heat body tissues in order to harm us, and that the radiation exposure levels, which only take thermal effects into account, are catastrophically irrelevant, as they don’t protect against non-thermal effects. Wireless technologies are not given adequate pre-market safety testing; instead, so long as the radiation falls within the industry-friendly, thermally-based, exposure levels, they are assumed to be “safe”. When pregnant women, infants and children are being routinely exposed to pulsed microwave radiation, and are actively targeted by advertisers and the tech industry (despite all the health effects that have been documented over the decades, and all the talk of precaution), it is surely time to say “no more experimentation”, no more hoping that once the interaction of non-ionising radiation with us is fully understood, the cumulative effects of chronic exposure to this ubiquitous radiation won’t turn out to be as bad as feared – by which time, it will all be too late anyway. Most of those affected by this radiation, including myself, are not scientific or medical experts. We are desperately waiting for those who are suitably qualified to catch up with what so many of us already know through our personal experiences. And yes, this includes “self-diagnosed” EHS people, such as myself. This radiation is harmful, and if we want our species to continue and thrive, this truth needs to be exposed, the radiation and protection agencies that are asleep on the job (or cosily linked to industry) need to be exposed, and Governments that set radiation exposure levels for their countries need to be getting proper, objective, biologically and scientifically-based advice, and need to act on this.